Background: The shape and protrusion of the brow bones has aesthetic implications for both men and women. While men can have some brow bone protrusion as a masculine facial feature, women should have a smooth and non-prominent brow bone shape that lacks any visible brow bone break up into the forehead. Brow bone reduction is most commonly used in men with very protrusive brow bones and in male to female transgender facial feminization surgery. 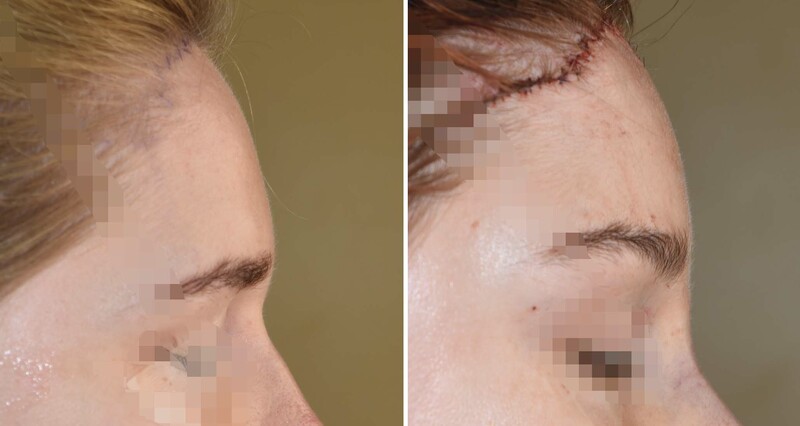 As a result these types of brow bone reduction require a setback bone flap technique to create a significant change. This is where the outer table of the frontal sinus (brow bone cortex) is removed and then put back after being reshaped. This is necessary because the brow bone over the frontal sinus is not thick enough to allow for a thinning of the bone only by shaving to achieve the desired setback effect. In contrast brow bone reduction that is done in genetic females that have a more natural masculine facial appearance uses a different technique. The amount of brow bone reduction needed is more modest and within what the outer table bone thickness can accommodate. (2 to 4mms) Equally importantly reducing the tail of the brow to create the temporal sweeps has no bone reduction limitations. Case Study: This female wanted to soften her facial appearance by reducing her brow bones in combination with a temporal browlift. She had some modest brow. bone protrusion but with a completely horizontal brow shape and lateral orbital rim hooding. Her x-rays showed the thickness of her brow bone over the glabellar area, the most critical area for a burring reduction. Under general anesthesia, an irregular hairline incision was done along the hairline from one temporal side to the other. The forehead flap was elevated down to and over the brow bones with preservation of the supraorbital nerves. A high speed drill and burr was used to reduce the bone thickness of the brow bones of 2mm to 3mms per side. The differences in the bony protrusion could be appreciated with one side done and the other not yet reduced. The final burring kept 1mm of bone over the labella with reduction of the lateral orbital rim down to the level of the frontozygomatic suture. The anterior temporal line above it was also reduced. After the bony reduction a temporal browlift was performed by excising forehead skin/temporal hair-bearing skin in a vertical vector above the outer brow. No central forehead skin was removed. While the bone and soft tissue excisions were more modest in quantity, the combined effect could be appreciated at the end of surgery. 1) Brow bone reduction by an outer subtotal corticotomy (shaving) produces a modest brow bone change and reshaping of the superior orbital rims. 2) The inner half of the brow bones are limited in reduction by the underlying frontal sinuses. 3) The outer half of the brow bones is not limited in its amount of reduction or reshaping as it is absent of the frontal sinus.